KFC is a favorite in my home and I am sure in every chicken lover’s home too..After all who can resist the finger licking good chicken they serve at KFC. It is the world’s second largest fast food chain (first is Mc Donalds) and is known to serve the yummiest chicken. There’s fast food and there’s KFC.Their technique of pressure frying and Sander’s secret spice mix of 11 herbs and spices yields the hard to resist, tastiest,crunchiest and juiciest chicken ever. 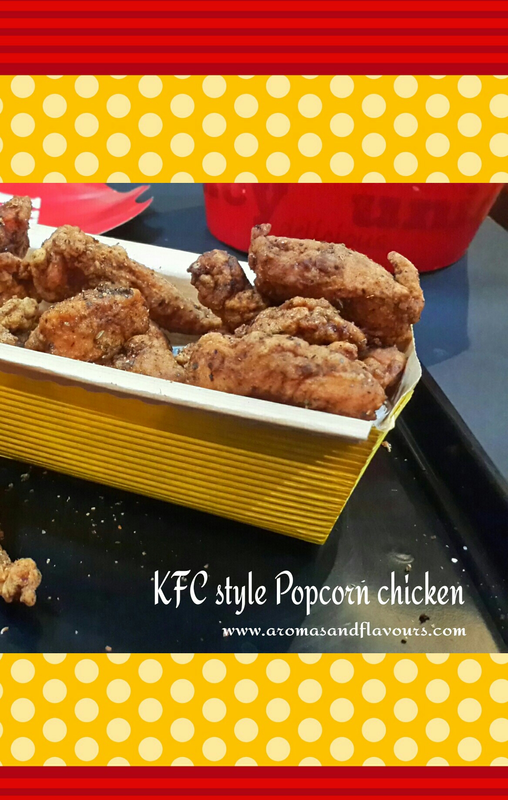 Ofcourse nobody does chicken like KFC, but we can try making it at home and get as close to the original as we can. I tried making Popcorn chicken and it was just so good. It is made with chicken breasts cut into bite-sized pieces ,seasoned and dredged with 11 ingredient herb and spice mix and deep fried. However my spice mix is 10 ingredients only because I omit MSG whenever I cook for kids. If you are trying this recipe you may or maynot want to use MSG. MSG or MonosodiumGlutamate is a flavor enhancer used commonly by food industry. It gives the 5th taste-Umami.It can be found almost everywhere,ranging from canned foods,frozen dinners, meats,restaurants,fast foods,soups, crackers, salad dressings and much more. It’s found in local supermarkets, in your child’s school cafeteria and shockingly even in baby food and infant formula.MSG is that secret ingredient which makes all these foods tastier,robust and smell fresher. It leaves that lingering after taste on your taste buds.Though FDA has declared it ‘safe’, health experts claim that MSG is toxic and can have harmful effects on the human body. But one thing for sure is that this recipe for Popcorn chicken with my 10 ingredient spice mix makes the juiciest chicken nuggets with a crunchy bite.And since it is made at home with love and care, it is very healthy too. 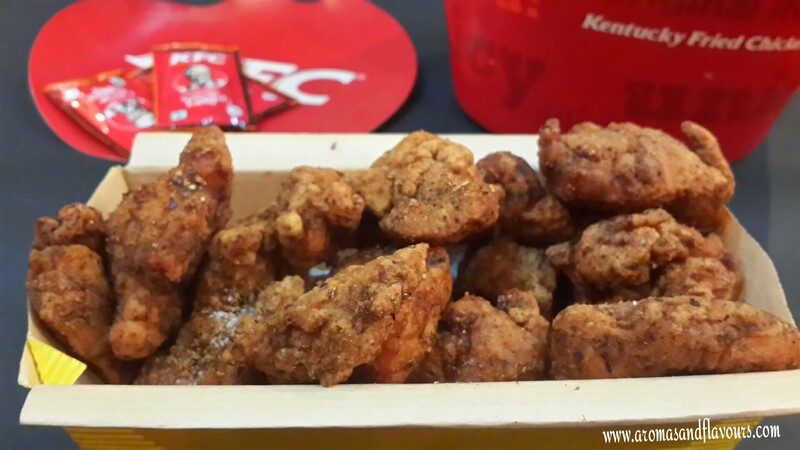 So, why not surprise your kids this weekend with this tasty chicken which tastes just like KFC. In the pictures you may find the chicken pieces a little bigger than the popcorn size. I did that on purpose. Because I wanted the nuggets to be more moist and juicy. You can cut them into smaller pieces if you wish. Mix the chicken with all the above ingredients and leave it covered in the fridge for 4-6 hours. This soaking time is necessary as it makes the chicken moist. Except the flour,put all the other ingredients into a blender and blend till well mixed and fine. Now add this spice mix to the flour and mix well. Dredge the soaked chicken pieces in this seasoned flour . Deep fry immediately until golden brown.Drain on a paper towel and serve hot. I am taking this delicious snack to party with my Fiesta Friday friends. Wow! Can’t believe it is the 90th Friday already and it just seems like yesterday. We have some new party co-hosts Effie @ Food Daydreaming and Lindy @ Lindy Mechefske to help out dear Angie. So let’s not waste time and rush to the party…. Previous Post Fruit ‘n Nut chewy Granola bar – and a Selfiesh world! Thanks for the appreciation Neetu 🙂 As a doctor you must be aware of the harmful effects of MSG which is a compulsory addition in restaurant foods. So if we can manage to make something similar at home without the chemical it can indeed be a blessing for us and our families. Haha Thanks!! I would love to do the same. Is there any way we could bake this instead of deep frying it? Or do you think it wouldn’t come out the same? Thanks Dana 🙂 Even I wanted to try baking them but wasn’t sure. Maybe if we substitute half the flour with panko bread crumbs it should work well. 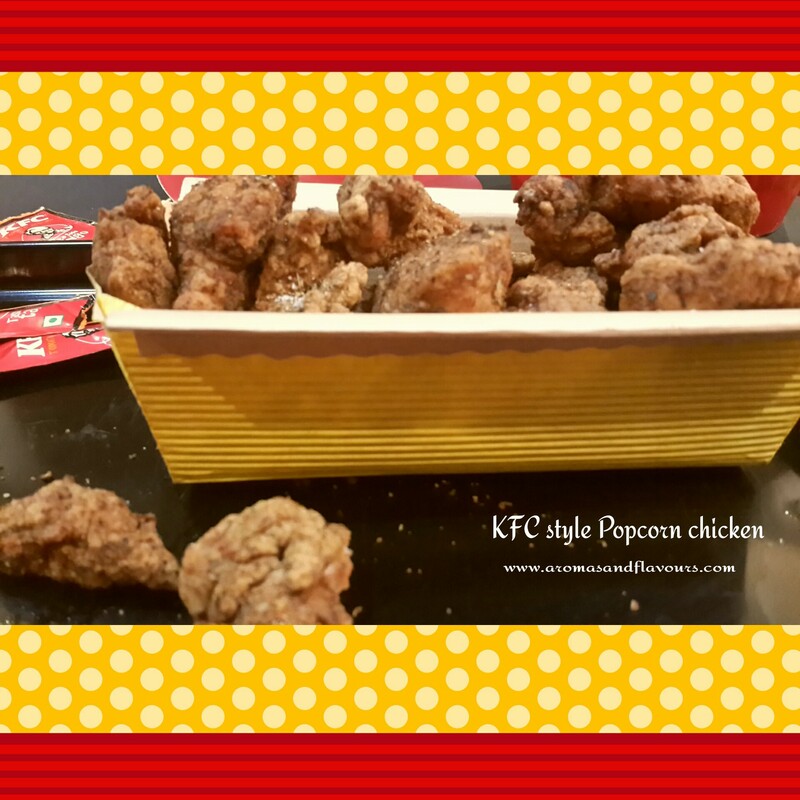 My son loves popcorn chicken and now I have your recipe to make it! Looks absolutely delicious! This looks delicious! I love when you can make something at home and get rid of the crap that is added in the commercial versions! Thank you so much Julie 🙂 It came quite close to the original. My kids loved it. Mhmmm! Homemade popcorn chicken sounds delicious! And, this is something that I can totally make. I love your tip to make extra seasoning, so these are finger licking good. I know that I’ll be grabbing these by the handful. Happy FF, and I hope you have a fabulous weekend! Growing up we were allowed KFC once a YEAR! But boy was it good. I think my mom would have allowed these once a week! Drooling! Thank you for such a lovely thing to say. You made my day. The chicken turned out real good plus the bonus of it being healthier than its commercial original. OH I AM TOTALLY making a paleo version of this deliciousness!!! Thank you Jhuls. They were almost as good. Didn’t miss msg at all. I love popcorn chicken! I am so glad to have found a healthier version, many thanks. Thank you for the kind words ☺ They tasted scrumptious, quite close to the original. The chicken pieces can be cut smaller to mske them crunchier. Looks delicious! I must make this one! Thx so much!